Alastair Cook marked his final Test appearance with a fifty before India's Jasprit Bumrah sparked an England collapse at the Oval on Friday. England only lost one wicket before tea and were making steady, if slow, progress at 131 for one on the first day of the fifth Test. But Cook's exit for 71 sparked a slump that saw six wickets lost for 48 runs, with England captain Joe Root, Jonny Bairstow and Sam Curran all out for noughts. At stumps, England were 198 for seven, with Ishant Sharma taking three for 28 in a miserly 22 overs and fellow paceman Bumrah two for 41 in 21 that included two wickets in four balls. Cook, England's all-time record Test run-scorer, was making his final appearance at this level before international retirement. The 33-year-old left-handed opener, who will continue to play for Essex, came into this match having scored 12,254 Test runs at an average of 44.88 including 32 hundreds. But he has struggled for runs lately, with his previous best score this series the 29 he made during India's 203-run win in the third Test at Trent Bridge. "The guard of honour was such a nice gesture but you're focused on batting and you don't have time to appreciate it," Cook told Sky Sports. "The reception I got was fantastic. it went on a bit and that makes you even more determined not to get out." "There is nothing worse than going out without contributing. I am pleased to get a score and disappointed to get out when I did." Cook, extending his England appearance record to 161 Tests, was thrust straight into the action when Root, his successor as England captain, opted to bat first after winning the toss on a sunny day. England had already won this five-match series after a 60-run victory at Southampton gave them a 3-1 lead. Cook, who walked out to a guard of honour from India, struck two trademark boundaries off successive Bumrah balls -- a square-cut and a pull. 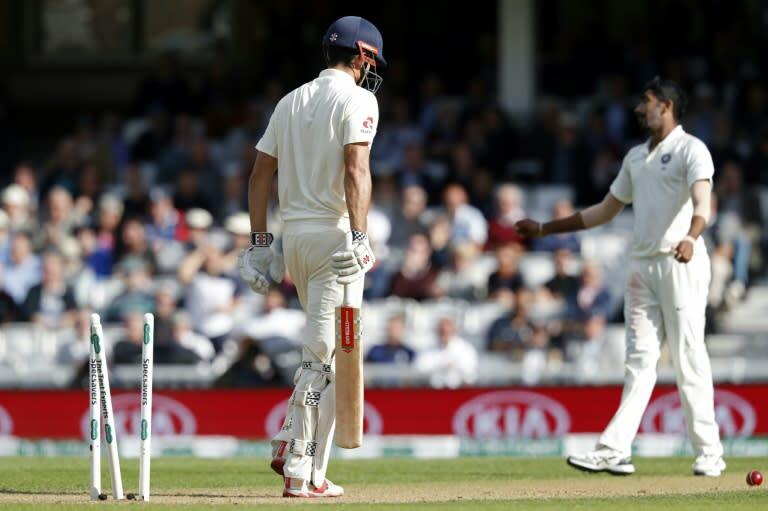 The under-pressure Keaton Jennings made 23 in an opening partnership of 60 with Cook before he carelessly turned left-arm spinner Ravindra Jadeja to KL Rahul at leg-slip. England were 68 for one at lunch, with Cook 37 not out and Moeen Ali -- one of an all left-handed top three -- two not out. Both batsmen were then dropped on their interval scores. Cook was missed by Ajinkya Rahane in the gully off Sharma and India captain Virat Kohli floored a far more difficult chance at third slip after Mooen flashed hard at Bumrah. Luckless paceman Mohammed Shami repeatedly beat the outside edge without reward. "It was an unbelievable spell from Mohammed Shami," said Cook, who completed a 139-ball fifty, including six boundaries, with a capacity crowd giving him another standing ovation. Remarkably,it was the first fifty by an opening batsman on either side in this series. Cook scored a century on his Test debut, against India at Nagpur in 2006. But his hopes of becoming just the fifth player to score a hundred in both their first and last Tests would have to wait until England's second innings. Cook's typically patient vigil of more than four hours ended when, playing defensively, he inside-edged Bumrah onto his stumps to end a 190-ball innings including eight fours before walking off to a third ovation of the day. "Whether it kept a bit lower than your subconscious brain thought, whether I could have got forward –- I don’t know," said Cook. "But it was disappointing. It was a bad shot." Root may have been batting in his favoured position of number four, but three balls later he was lbw to Bumrah when playing across the line. Bairstow then fell for his third duck in four innings when he jabbed at a Sharma delivery to give wicket-keeper Rishabh Pant a simple catch. England had now lost three wickets for one run in nine balls. Jadeja, playing his first match this series, in place of injured off-spinner Ravichandran Ashwin, then had Ben Stokes lbw for 11. Moeen, batting in England's longstanding problem position of number three, completed a 167-ball half-century only to fall for exactly 50 when caught behind hanging his bat out against Sharma. Curran had revived England from the depths of 86 for six in their first innings at Southampton but, on his Surrey home ground, he was caught behind second ball off Sharma.